Add an element of customer interaction at your next showcase or display with custom made tablet stand. Attract customers to your stand or booth without pressure. Tablets are a great way to give your customers more information about your product, services or feedback. We could tailor our tablet holders to any models. No minimum quantity. Try us. Our custom branded TABLET stands are the perfect way to create personalised tablet touchpoints for unattended environments. 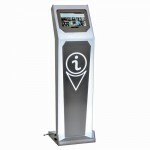 Secure floor stand tablet kiosk offers simple and smart ways to use tablets in more places: banking & finance, retail, hospitality, education, and the list goes on.